In the mid 2000’s I took part in an annual gathering/group project at University of the West of England called ETC (Enamel, Textile and Ceramics). This was a gathering of practicing artists and academics, usually in July and at the end of very busy teaching year for some. Mostly we would come up with a tool to focus on and then investigate this through talking and making. The best parts were the talking and making, of being together of coming back to your bench after a break to find that someone had left you a half finished/begun piece. 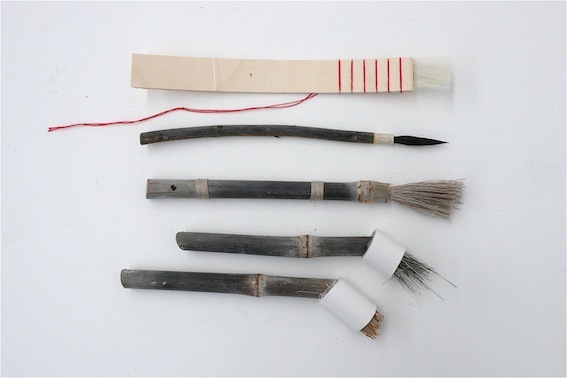 The following are some images of some work made during a brush-making gathering. 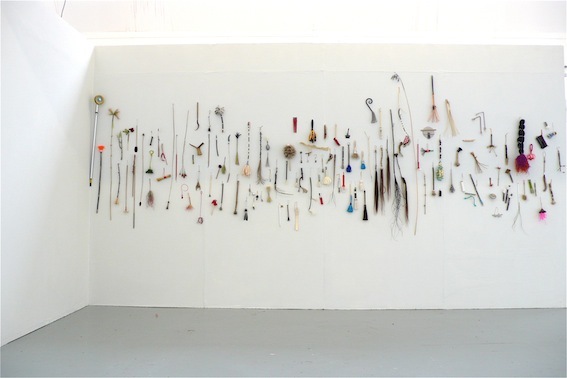 I have gone on to use this methodology for making and learning in various studios/workshops that I have led all over the world…Over the last ten years I have often thought about mark making through thinking about place and material. Exploring a place through walking, looking at the material of that place…the natural and the manmade…the left over scraps of things. I have wondered whether by using the material of a place in making tools – a feeling of the place can somehow be embodied in the subsequent marks made. The following are some extracts and images from various workshops I have led…all began with a walk and led to an understanding of the place, it’s material and a new trace being left behind.